The Kawasaki KX450 is a motorcycle produced by Kawasaki from 1974 to 2008. The Kawasaki KX450 was an off-road and motocross motorcycle manufactured by Kawasaki in 1974 along with its smaller brother, the Kawasaki KX250. 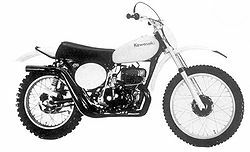 These were the first of the KX-series motorcycles. The KX450 used a plastic fuel tank and was developed from the 1973 Kawasaki F12MX. This page was last edited on 26 August 2010, at 18:13.